Review: Avalanches, murder, hypothermia. Teenager Max Gordon is on a quest to save his best friend Sayid, and the entire continent of Europe. In the second installment of the Danger Zone series, Ice Claw, David Gilman does not let up the pace from The Devil's Breath. While in the mountains, Max witnesses the death of a Basque monk whose last words send him on an epic quest. Max is following a very faint trail of clues. Somehow he is blamed for the murder of the monk and the police are after him. Now he must find a way to put the pieces of the puzzle together. I love the well-developed characters. There is great action, suspense, and excitement. For example, when Max almost dies during the avalanche I was afraid that he was going to die. One thing to consider before reading this book is that some parts may be hard to understand if you have not read the prequel to this, The Devil's Breath. The only thing that I disliked was how long the book was. At some points, the author went into too much detail. I rate this book a nine out of ten. We would like to thank Random House for providing a copy of Ice Claw for this review. 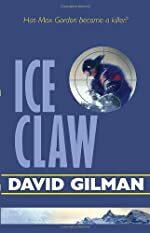 Have you read Ice Claw? How would you rate it?